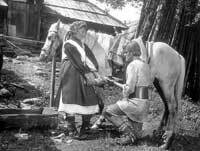 The film is based on a novel of the same name, published in 1912 by Ukrainian author Michail Kocjubinskij, who places a Romeo- and Juliet-like story in the milieu of the Huzulians (Ruthenians), who live in the Karpato-Ukraine as mountain peasants and sheperds. The love between Ivanko Palicuk and Maricka Hutenjuk, who have been knowing each other since childhood, breaks down because of the irreconcible hostility between both their families: Maricka's father has killed her lover Ivanko's father. The film does not use a psychological, realistic style of telling the story but an associative hallucinogenic way of stylizing image and sound which repeatedly blurs the boundary between reality and dream. An important part of this is played by the alien world of the Huzulen's costumes and rituals, who are presented in an authentic way mixed with Paradžanov's own phantasies. He works with a linkage of several novels: "Ivan und Maricka" shows the shadow already hanging over the couple's childhood, "Polonina" picks this up musically. "Loneliness" shows Ivan lost and desperate in foreign parts. For "Ivan und Palanga", Paradžanov produced a mystical wedding ritual in the spirit of Huzulian folklore.